Olympus is proud to introduce the OmniScan® SX, a flaw detector that benefits from more than 20 years of phased array experience and shares the OmniScan DNA. For improved ease of use, the OmniScan SX features a new streamlined software interface displayed on an 8.4 in. (21.3 cm) touch screen. A single-group and non-modular instrument, the OmniScan SX is easy to operate and cost-effective for less demanding applications. The OmniScan SX comes in two models: the SX PA and SX UT. The SX PA is a 16:64PR phased array unit, which, like the UT-only SX UT, is equipped with a conventional UT channel for pulse-echo, pitch-catch or TOFD inspection. Compared to the OmniScan MX2, the SX is 33% lighter and 50% smaller, offering an unprecedented level of portability for an OmniScan. The OmniScan SX touch screen offers a full-screen mode option that maximizes visibility, essentially converting many menu functions into easy touch-screen operations. The intuitive interface provides smooth menu selection, zooming, gate adjustments, cursor movements, and text and value input. These, along with other premium integrated features, including easy-to-follow setup and calibration Wizards, a rapid refresh rate for both the S-scan and A-scan displays, and a fast pulse repetition frequency (PRF), make the OmniScan SX a highly efficient inspection tool. 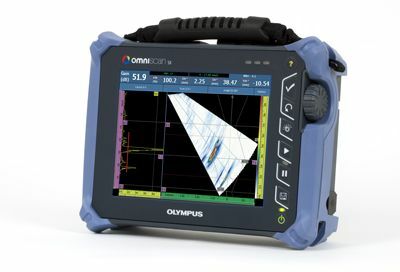 The OmniScan SX is fully compatible with the extensive portfolio of Olympus scanners, probes and accessories, as well as with its dedicated software companions, NDT SetupBuilder and OmniPC. 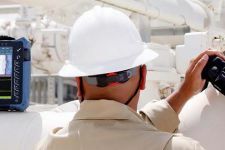 Combined, the complete family of software and hardware contributes to a streamlined and efficient inspection workflow, from design and setup to acquisition and analysis. The new OmniScan software features enhancements for greater functionality in weld and corrosion markets. This software presents multiple features for easy, fast, and comprehensive inspection strategy elaboration that can directly be imported in the OmniScan SX. 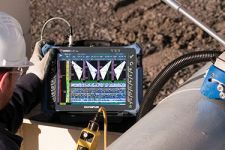 Thanks to NDT SetupBuilder and OmniPC campanion software, the OmniScan SX can be dedicated exclusively to calibration and acquisition tasks or, if preferred, can perform all the steps of an inspection, right on its large, user-friendly touch screen. The OmniScan SX enables easy configuration of inspection parameters for either manual, one-line, or raster encoded scans. The acquisition is displayed in real time through different views and offers the ability to store data on a hot-swappable SD card or USB 2.0 device. 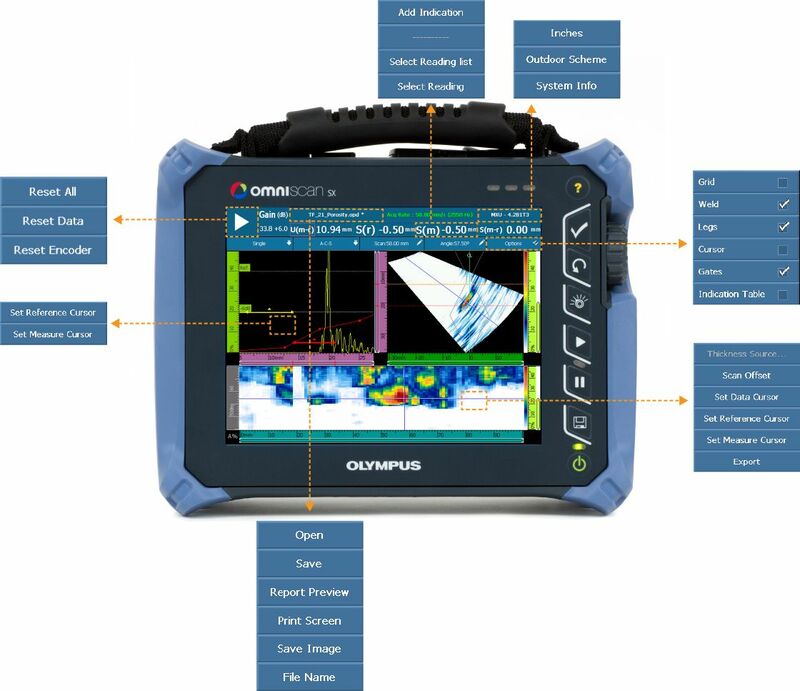 The OmniScan SX and OmniPC can both be used to generate reports with an indication table listing up to eight readings, such as amplitude, position, and size of the defects. The report can also be customized with additional readings and comments specific to each indication, and can be saved as an HTML document. RayTracing tools allow the indication positions to be represented on the weld profile. High-resolution images can be inserted along with all relevant inspection parameters. The Omniscan SX provides Olympus with a new and versatile tool to add to its arsenal of innovative and creative complete market solutions aimed at simplifying your workflow and improving overall productivity. 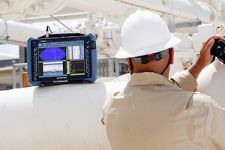 The OmniScan PA is at the heart of the manual and semi­automated phased array weld inspection solutions developed by Olympus for the oil and gas industry. These systems can be used for inspection in compliance with ASME, API, and other code criteria, while offering high-speed detection capabilities, and facilitating indication interpretation. Zero-degree inspection just became even more accessible with the arrival of the OmniScan SX. 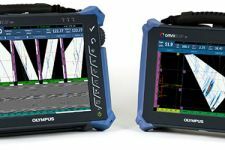 For corrosion or composite inspection, Olympus offers field-proven solutions for detection of anomalies or wall loss. TOFD is an easy and efficient approach for primary detection of weld defects. It is quick, cost-effective and capable of sizing defects present in the volume of the weld, a problematic area for manufacturing defects. Using ultrasonic techniques, inspection of components can detect cracks, wall loss, and other damage. 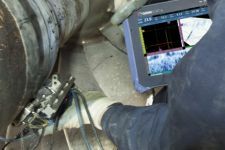 With the capacity for both angle and linear zero-degree beams, the OmniScan SX is a very cost-efficient solution for this type of single-group inspection. Industrial XY (motorized and manual) and manual weld inspection scanners provide reliable, accurate performance in a wide range of heavy duty industrial applications in which scanners are used to improve quality and reduce costs. PA scanners and scanner accessories such as motor controllers and water pumps complete the Olympus line of scanner products. Our full range of weld inspection solutions provides unmatched capabilities for applications that include the location and sizing of hidden cracks, voids, disbonds, and similar discontinuities in welds, forgings, turbines, and other structural components. We offer a wide range of measurement features and application-specific software options. 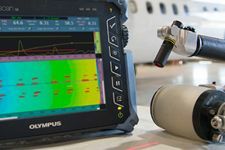 Olympus NDT has a wide range of innovative products utilizing advanced technologies for the manual or automated inspections of internally corroded pipes and tanks, high-temperature surfaces, corrosion mapping of large pressurized vessels and stress corrosion cracking are typical applications that require either manual or automated inspections. Olympus offers complete solutions for the inspection of carbon fiber reinforced polymers flat panels and radii. These solutions are based on the field-proven OmniScan® PA flaw detector, the GLIDER™ scanner (flat panels), and phased array probes dedicated to CFRP inspections. 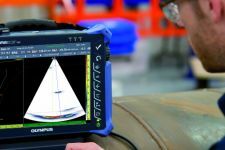 Olympus has a wide range of scanners to address fabrication or maintenance weld inspections needs. We have solutions for small pipes up to flat plates with the capacity to hold multiple probes for a complete weld volume coverage. Even if you choose a motorized or manual type, you will be amazed by their versatility, dependability and repeatability. Corrosion mapping is a high demanding application that requires up to 2 precise axes encoding position capability of a unique probe. 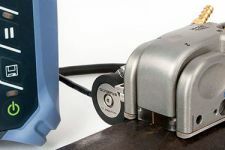 The scanners can be mounted on pipes and flat surfaces and are easy to use for fast detection of defect from manufacturing induced lamination to in-service wall thickness reduction. Inspection of large area requiring fast C-scan acquisition is a key feature for the aerospace industry. Adapted scanners that mainly use suction cups are well suited to hold on composite surfaces and perform mapping with up to 2 precise encoded axes. From couplant feed units to pulsers and preamplifiers, Olympus offers multiple accessories to help improving data quality as well as ease and repeatability of inspections. SDHC card* or most standard USB storage devices. *Lexar® brand memory cards are recommended for optimized results. The OmniScan SX meets or exceeds the minimum instrumentation and software requirements as specified in ASME, AWS, API, and EN codes. 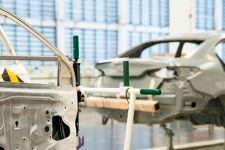 The EdgeForm phased array solution enables automotive manufacturers to inspect for voids in bonded or glued seams in trunks, hoods, and door panels. Weld inspection probes offer housings combined with a front or top exit cable to avoid interference with the scanner probe holder. These probes are suitable for manual and automated inspections of welds. The NEW A31 and A32 Weld Series phased array probes and wedges simplify and standardize weld inspections with fewer designs, and improve signal-to-noise ratio. Dual matrix array (DMA) probes consist of two matrix array probes wired to the same connector with the capacity to perform transmit-receive longitudinal (TRL) sound beams. Available in 2.0 MHz and 4.0 MHz, they are particularly helpful when testing cladded pipes or highly attenuating materials. 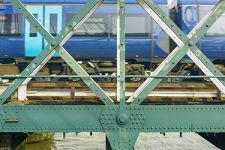 The new Dual Linear Array™ probe offers several advantages over conventional ultrasonic dual element transducers for corrosion survey applications. This phased array solution improves productivity through features such as larger beam coverage, faster scan speed, and C-scan imaging with increased data-point density. Our innovative flexible phased array probe enables users to undertake new applications. The FlexoFORM™ scanner uses a flexible array probe to perform corrosion inspection on pipe elbows. Our A24 probe series for manual contact inspection incorporates an ergonomic case design, replaceable membrane, and large square aperture to work in a variety of applications. The 0.02-inch (0.5 mm) thick membrane makes it simpler to verify coupling, glides smoothly on rough surfaces, and is resistant to wear. Small-footprint probes offer access to confined areas (A00 probe has an 8 × 8 mm footprint). Near-wall probes offer a shortened dead zone at both ends of the probe (1.5 mm between center of first or last element and housing edge). 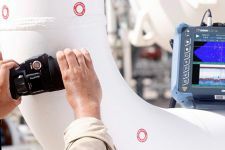 They are well suited for composite channel inspections and are used for C-scan inspections of composites (delamination, disbonding, and porosity). Immersion probes are designed to be used with a water wedge or in an immersion tank when the test part is partially or wholly immersed. They are longitudinal wave probes that can be set up for refracted shear-wave inspections using a Rexolite wedge. Curved array probes are made with a corrosion-resistant stainless steel case and are guaranteed waterproof up to 1 m underwater. The acoustic impedance of these probes matches water. They are compatible with adjustable immersion wedges and are used for the inspection of carbon fiber reinforced polymers (CFRP) corners and in addition to the inspection of composite for delamination. Immersion corner wedges for curved array probes are available in specific radius and angle and also with adjustable radius to fit on various components to be inspected. These wedges are designed to perform manual scans and to accommodate the Mini-Wheel encoder. 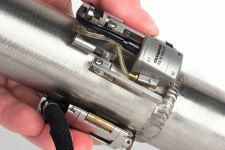 Integrated wedge and code compliant probes combine the probe and the wedge in the same housing, offering the lowest-profile probe-and-wedge combination for contact angle beam inspection. Coupling is always good between probe and wedge interfaces, as there is no need for couplant between the probe and wedge. These probes are used for manual weld inspection using 40° to 70° simultaneously in addition to manual inspection of stress-corrosion cracking and AWS and DGS code compliant applications. The wedges for angle beam probes are available in standard refracted angles of 0°, 45°, 55°, and 60° in steel for angle-beam inspections from 30° to 70°, SW or LW. They come with stainless steel screw receptacles providing a firm anchoring of probes to wedges. The IHC wedge option can be ordered to improve the quality of the inspection: irrigation, mounting holes for the wedge holder to work with any Olympus scanner, and carbide pins to increase wear resistance. Q&A: Preferred phased array technique, shear wave tip diffraction or amplitude drop sizing? Thanks for Joining Us at FABTECH 2016!